A couple of months ago, I met a fellow blogger who wrote about inspiring things. I loved reading her blog because all of her messages were heart-felt, passionate, and positive. Every time I read her words, I felt uplifted and enabled. We started following each other and getting to know each other in a way that only social media could provide, and through the internet, we have become good friends. So, in order to celebrate our friendship, we decided to come together and throw a giveaway! We have both been so excited about this giveaway and I have been absolutely giddy about the whole thing! But first, I want to introduce you to my favorite writer, Chelsea from The Girl Who Loved to Write. 1. So tell us about yourself! What's your name and the name of your blog? -I'm Chelsea and I blog at "The Girl who Loved to Write." 2. Tell us a little about you and your blog. -I started my blog in college because I wanted a way to hold myself accountable to writing after graduation. Now it's a place for me to dream and be inspired and write about life. 3. If you could go back in time and meet anybody, who would it be and why? -Audrey Hepburn. She was just so dang classy. 4. What kind of famous would you rather be? Music sensation, athlete, or movie star? -I'm gonna make up my own answer and say author! I have no musical, acting, or athletic talent so we better just save the world from that haha. 5. Who would you say has inspired you most? -Definitely my mom. She has always encouraged me to go after my dreams, no matter what they were. She's my best friend and is always there to brainstorm my dreams with. She's also the best wife/mother/homekeeper on this planet, and I aspire to be even half as amazing as she is. 6. What kind of things do you sell in your Etsy shop? -My etsy shop's name is "Pretty Lovely Littles" and I try to shape things around that. Pretty little things to brighten up your life whenever you see them! 7. Do you have special deals or promos going on right now? If you use the code "CHEVRON" you can get 20 percent off anything in my shop for the next month! I'm so excited to be doing this giveaway with Sue! She is one of the sweetest bloggers I've ever "met" in blogland, and I absolutely love her. If you don't stalk her blog daily, you absolutely should. Aw! Thank you, Chelsea! It's been fun to get to know you a little better on my blog today and I am SO excited about what you have in your shop! Click on this link to see everything that she has to offer, and don't forget to stop by The Girl who Loved to Write and get to know Chelsea even better. 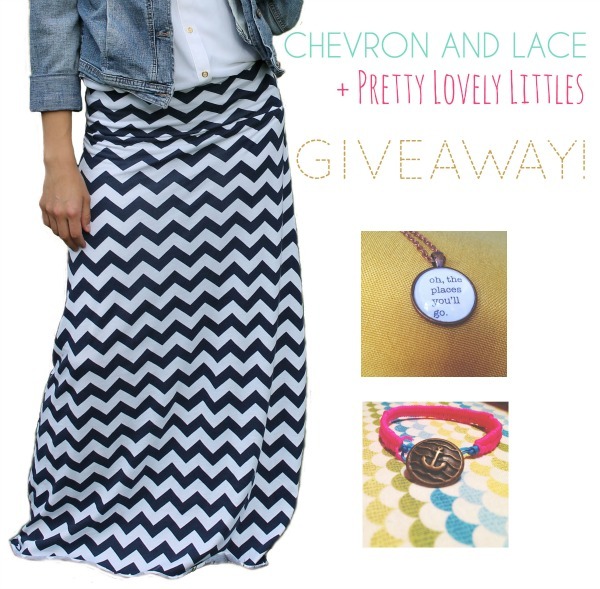 Now, our giveaway today is a little somethin' somethin' to freshen up any wardrobe! Say hello to what could be your new favorite outfit! Each of these items are hand-crafted by Chevron and Lace and Pretty Lovely Littles. The giveaway closes Sunday night, and you can enter multiple times via twitter, instagram, and facebook. Good luck! Looove you Sue! These skirts are super cute. These are adorable! the yellow and light blue are my favorite! Yellow isn't my favorite color to wear, but when I finished making one of these maxi skirts in yellow? Love. Thanks Bekah, Heidi, and Chelsea! I love all the colors here Susan. Really pretty. I think I like the Navy or Black best! You're so creative. I absolutely love your skirts, and everything you make for that matter. You are just too talented. Sue! I didn't follow you on bloglovin but I can't get that entry to go away. I entered on my phone and somehow that one showed up not the one I wanted. Can you fix it? Haha! Phones are sometimes hard to work with blog and internet stuff, huh? Don't worry about it. Thanks for being honest! So cute Susan! Don't know what color I'd pick! Ooh I'd love the coral, or tiffany blue, or navy! I think I would love a navy skirt! I win! !